Relacionarse directamente con nuestras marcas favoritas es cada vez mas fácil gracias a las redes sociales, nos encanta participar de sorteos, comentar nuestras dudas y que nos respondan, y sentirnos parte. Es por eso que Cacharel y su conocida fragancia Amor Amor, invitó a todas las fans (que tuvieran entre 16 y 25 años, no hay derecho!) a participar de un casting digital (mediante videos y fotos) para armar su nueva campaña publicitaria “Constellation Of Love”. Esta acción se llevo a cabo en Francia, España y America Latina. La idea de la campaña fue ilustrar la sensación del primer beso, sin duda una campaña mucho mas fresca y descontracturada. Melania Soldo nos hizo un nail art divino! Estuve en el evento de Amor Amor, Constellation Of Love, que se hizo en uno de mis lugares favoritos: La Mansión del Hotel Four Seasons, en donde pudimos ver el video, llevarnos el perfume y además personalizarlo! 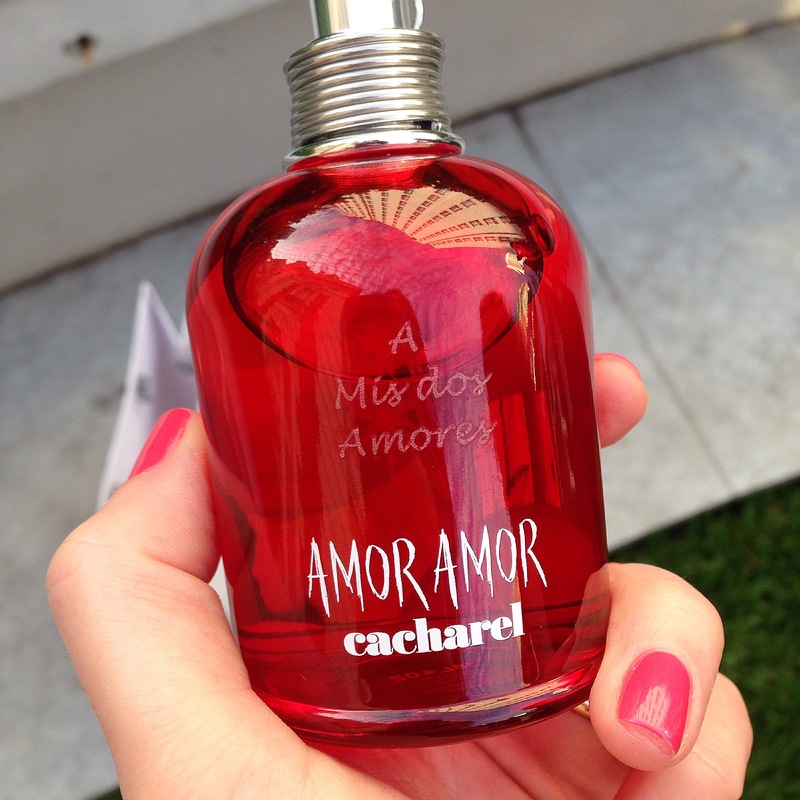 Amor Amor es una fragancia que ya conocía, pero que hoy redescubrí, es floral, tiene toques de mandarina, grosella negra, lirio, almizcle blanco y ámbar gris, es bien dulce y con mucha personalidad, pero que a la vez no invade (obvio que esto de los perfumes es muy personal). La marca va a seguir con esta idea de conectarse con las consumidoras para que formen parte de sus proyectos, así que estén atentas para poder participar! (me dijeron que van a ampliar un poco el rango de edad!!!!!!). Si quieren conocer más sobre la iniciativa, visiten la web de Amor Amor Casting. Acá el video de “Constellation of Love” con la feliz elegida para América Latina, Barbara Grattziani. Be in touch with our favourite brands gets easier every day thanks to the social networks, we love ask questions and be answered, and participate in contest and trivias. That’s why Cacharel and his fragrance Amor Amor, asked girls (between 16 and 25 years old) to participe in a digital casting (through photos and videos) to be the star of the new campaign “Constellation Of Love”. This action took place in Spain, France and Latin America. The idea was to translate the feeling of the first kiss, and the result was a more relaxed and fresh campaign. 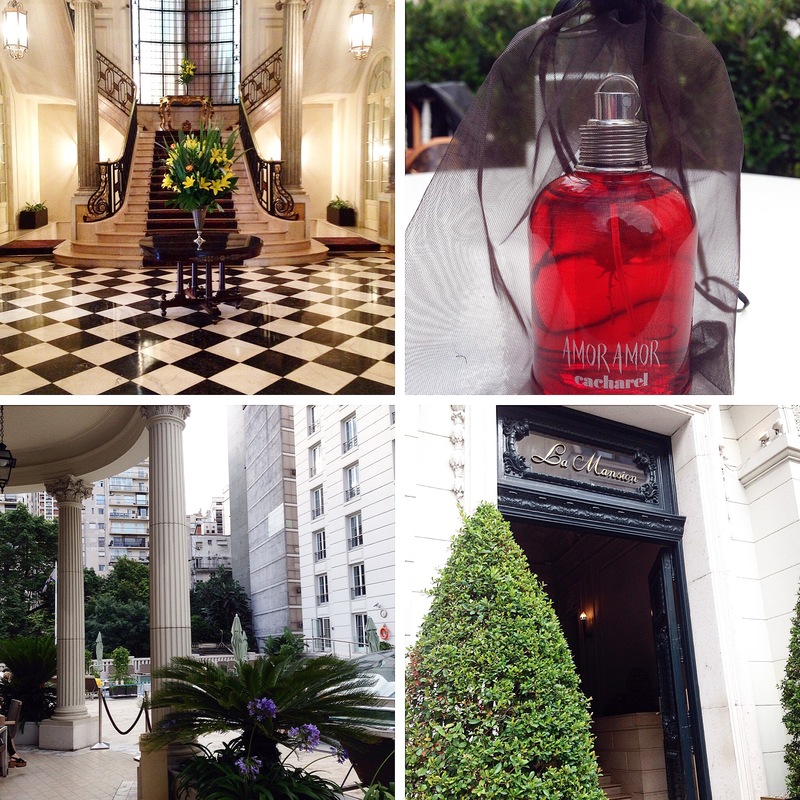 I attended to the event of Amor Amor Constellation Of Love, held in one of my favourite places: The Mansion of the Four Seasons Hotel, where we could see the video of the campaign, and got the fragrance that we customized with our names. We had a lovely evening, there were luscious things to eat and we drank the “Potion Of Love” a drink specially made for the occasion. I already knew the fragrance but, it was nice to rediscover it, is floral, with touches of tangerine, blackcurrant, lily, white musk and ambergris, is very sweet and with personality, however is very pleasant to use (of course this things are very personal). The brand is going to continue with this idea of being connected with consumers, so stay tuned to be able to participate in the next casting! (they told me the will extend a little the age range!!!!). If you want to know more about the casting, visit the website Amor Amor Casting. Hope you like the video of the “Constellation Of Love” campaign, featuring Barbara Grattziani, happily chosen to star the commercial for Latin America.